It is turn of the century Paris, and the bohemian demimonde is all abuzz after news of the great artist Vincent van Gogh’s death in Arles reaches them. The apparent suicide is complicated somewhat by the fact that the painter shot himself, then walked about a mile to a doctor’s before finally expiring. Why would someone kill themselves in such a roundabout way? Adding to this is the fact that in his final days, van Gogh told all he came in contact with about the mysterious “Colorman”, a dangerous paint salesman whom he apparently left the capital in an attempt to elude. This book was a little bit of a conundrum for me. On the one hand, I was interested enough to tear through the thing in a day and a half while sitting at the beach, and I really appreciated learning about French art history, especially that of the Impressionists and the Neo-Impressionists. On the other hand, I found the use of idiom and slang that recalls the way people speak in the modern era irritating. I would be remiss not to note the absolutely gorgeous construction of this book. 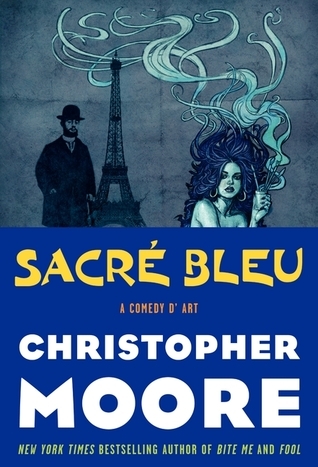 The eponymous “Sacré Bleu”, which I learned is the proper name for ultramarine blue paint, can be found throughout the book: in the beautiful cover image, which can be rendered text-free by pulling off a wrapper, and the fact that the book is actually printed with blue ink in both regular text and titles. If you do seek this book out, make sure you get this version, and not the one that just slaps the title and author’s name down in a Art Nouveau-y font sans wrapper. Also, inside the book, the famous works of art referenced are printed in full colour for you to enjoy and understand what’s being said about them. This was a great feature of the book, and I am somewhat intrigued to seek out more information about these wonderful works. This is the third book I’ve read by Christopher Moore, following Fluke and Lamb, both of which I remember liking when I read them back in high school. Moore seems to sit almost in a Terry Pratchett sphere of humour writing, but where Pratchett also constructs the fantasy world of Ankh-Morpork almost before your very eyes in the many Discworld books, Moore takes events that ostensibly happened in the real world and tweaks them for comedic purposes. Here lies my conundrum, as while I don’t know exactly how people who lived in the period talked, the way they do in the book still seems a little off. He’s not quite as jokey as a Tom Holt or a Robert Rankin, but sitting between art and baser comedy makes Sacré Bleu a little irritating at times. On the whole, though, if you’re interested in a breezy fantasy mystery set in 1890s Paris, check this book out.